As the global population rises, farmers will be expected to produce more food with less water, fewer fertilizers and pesticides, and a dwindling workforce. WSU researchers see part of the solution in the sky: unmanned aerial vehicles (UAVs). Widely known for their defense applications, UAVs could be a boon to agriculture. Lav Khot, assistant professor in precision agriculture at the Center for Precision and Automated Agriculture Systems in Prosser, works with colleagues to lay the groundwork for widespread use of UAVs in the fields. Dr. Khot has partnered with Digital Harvest, a developer of crop-management technology, and vehicle manufacturer Yamaha Motor Corp. Together they are testing the ability of Yamaha’s mid-sized unmanned helicopter to blow rainwater from Washington cherry orchards. Rainwater cracks the fruit and can devastate up to 90 percent of a cherry crop. Current methods of removing rainwater with manned helicopters are dangerous and expensive. Next season, the team will also test surgical spraying capabilities of the unmanned helicopter. The technology could help growers save resources by more precisely applying chemicals and nutrients. 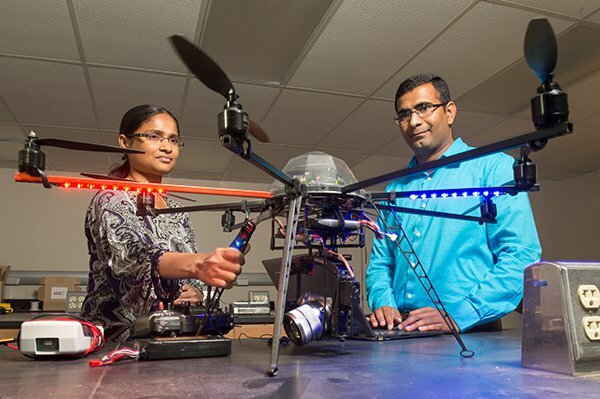 In addition, Dr. Khot and colleague Sindhuja Sankaran, also an expert in agricultural automation engineering, will test the performance of UAVs outfitted with sensors. Sensors could play many roles in agriculture: monitoring the health of crops, assessing water use and irrigation scheduling, and optimizing nutrient applications. The tests will also help crop breeders to quickly determine the success of a new cultivar bred for diverse conditions such as drought. The FAA is cautiously approving use of commercial drones in farming. In the meantime, WSU researchers can responsibly and independently test UAVs and sensors. Once the technology passes the tests, we may see its wider adoption by the farming community.